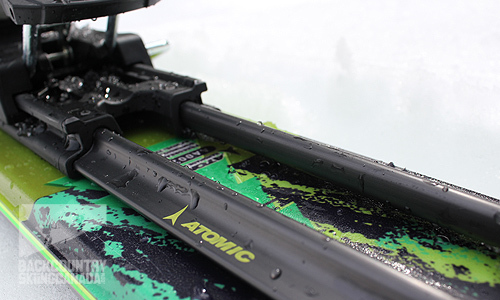 “What’s the 16 stand for?” I asked when I was first handed the Atomic Tracker 16 WTR bindings. The reply was that it referred to the Tracker’s DIN setting, which ranges from 7 to 16, and I immediately thought of that scene in Spinal Tap when Nigel describes his new speakers with the volume control that “goes to eleven.” Why would you need speakers that go to 11? Same reason you’d need bindings with a DIN that goes to 16, I suppose. In my opinion there are three types of people in the world who set their DIN to 16: 400-pounders, the dozen skiers who are paid to shred Alaska and punters. Despite the moniker, though, I was excited to try the Atomic Tracker 16s. 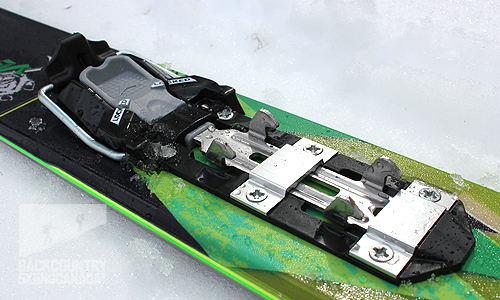 Not since the fiasco that was the Naxo has a company tried to construct a super-bomber binding with lots of metal that is equally efficient on the hill and in the backcountry. Actually, that’s not entirely true. Salomon has also expanded into this particular market with their Guardians, which, incidentally, are the exact same bindings as the Atomic Trackers because the two companies are owned by the same parent organization, Amer Sports. The only difference between them is the colour scheme and the name. 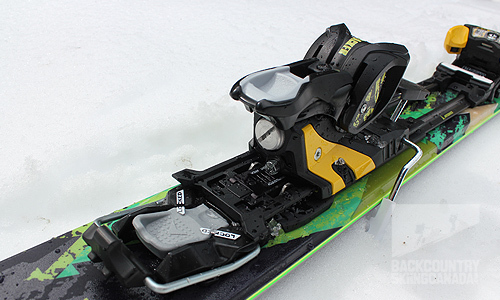 Read the full review of the Salomon Guardian 16 AT Bindings over here so you can better understand all the features of the Atomic Tracker 16 WTR Binding. Extra wide 80mm toe piece. Toe piece with boot engaged. The heel piece and riser. Boot engaged with the heel piece. Low profile frame at only 26mm in height. Tracker base plate with metal locking mechanism. Bottom view of the Tracker Binding and a look at the 90° forward rotation. 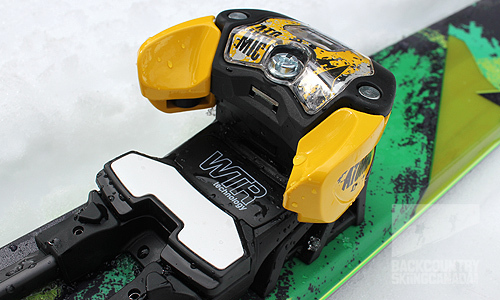 The reason these bindings are so bomber is to allow you to ski aggressively both on and off the resort runs. 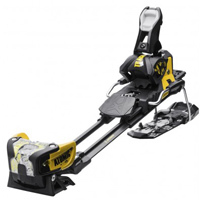 Other features that allow for this include the metal stays, which are really close to the ski so you can manoeuver them like an alpine binding, giving you powerful edge-to-edge transition control. Also, the metal toe hinge is super wide (80mm) and the brakes come in various widths to accommodate really fat skis, which, considering the way the industry is going with wider skis, this is a good thing. The entire lockdown system of the Atomic Tacker 16s is traditional in the sense that your boot goes in, the back lever pops up and it’s locked. To release the boot from the binding, you just press down on the back lever and pull your boot out. Where this binding differs from others, however, is how you access the touring mode. 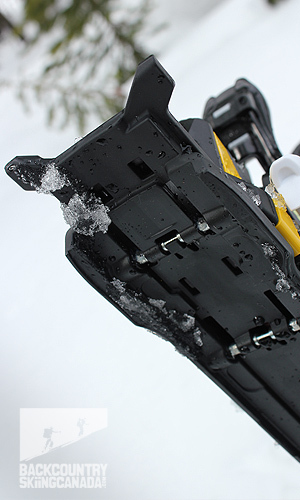 As mentioned above, there is a small plastic slide lever at the back of the binding that you press and push toward the rear of the ski with the end of your ski pole. This releases hooks underfoot and the binding has a full range of movement to allow you to skin up. 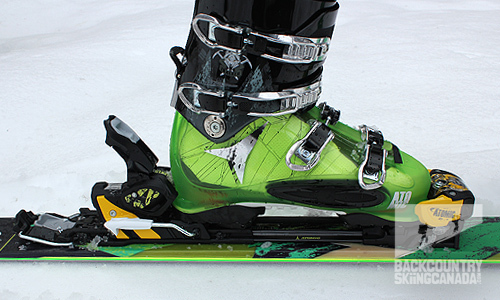 (In fact, the toe hinge has a full 90-degree pivot for optimal climbing and kick-turn capability.) On most days this system works but, again, the first time I tried the Trackers the conditions was heavy and damp and I found I had to use the tip of my pole to scrape out the snow that had gotten packed into the metal clips. 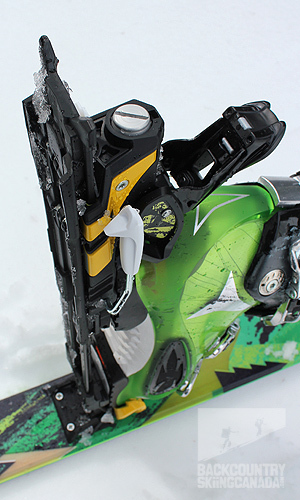 But, to be fair, on that particular day you’d probably find that with most backcountry binding systems. Another difference between the Tracker 16s and other systems is the riser. After you’ve pushed the slide lever back and unlocked the binding the next step is to bring the riser bar all the way forward to ensure it doesn’t lock again. That puts you into “flat” tour mode. You can then click the riser bar back and up and enter “steep” or “hike” tour mode. (The Trackers only have two settings.) 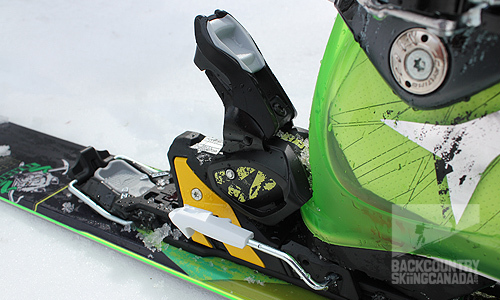 To lock the binding back down for ski mode, you push the riser bar all the way back so the locking clips are free and clear and then just stomp your boot down and it will lock. It took me a little practice to get the system dialled, especially the press/push part with my ski tip pole, but I have to admit I liked the way I could just press my foot down, lock into ski mode and go. The last piece I have to say about the Tracker 16s is that Atomic claims they are not compatible with other touring specific boots (ie: ones without ISO 5355 standard soles) so you have to either own a pair of WTR proprietary boots made by Atomic that fits the bindings, or you tour in your alpine boots. 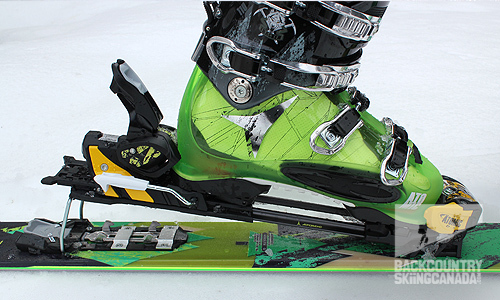 I’m unclear as to why the company decided to limit its market this way but perhaps in the future we’ll see a add-on modification that will allow you to ski in whatever boots you please. 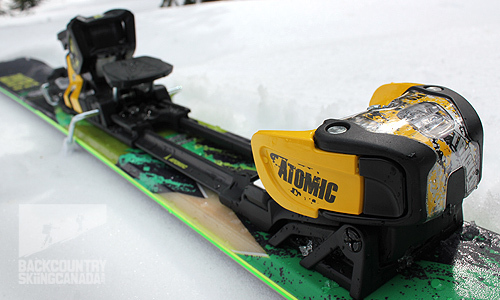 The Atomic Tracker sits much lower on the ski than other backcountry bindings so it skis like an alpine binding, meaning it gives you powerful edge-to-edge transition control. Plus the metal construction means it will be able to take a beating, both on and off the resort runs. This binding is heavy! If your goal is to get your legs in the best shape possible then you’ll want a pair of these to lug up the skin track with. But if you’re going on a long, multi-day traverse, I think the Atomic Trackers will weigh you down. Also, one of the only plastic pieces on the binding is the release lever, which can be finicky to use at first and I question it’s resilience. Maybe a metal alloy piece would be better? 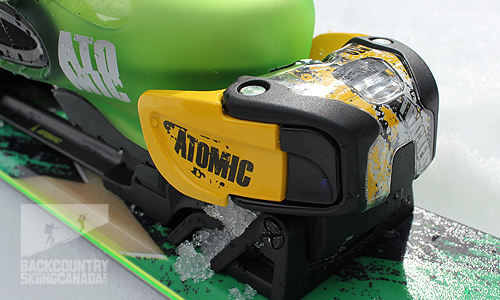 Finally, by not accepting touring specific boots (non ISO 5355 standard soles) Atomic has limited its market.